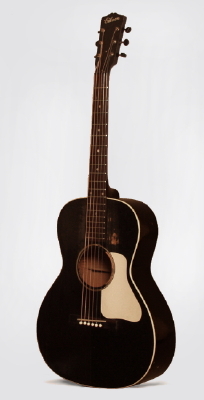 Gibson L-00 Model Flat Top Acoustic Guitar, c. 1932, made in Kalamazoo, Michigan, black lacquer finish, mahogany back, sides and neck; spruce top, soft shell case. A nice early 12-fret L-00, overall black-finished with the fairly rare white celluloid pickguard. The L-00 was a Depression-era staple for Gibson, offered this year at the rock-bottom price of $25.00. This one would be one of the last 12-fret body L-00's made, just before the instrument was re-designed into the more familiar 14-fret version sold up until WWII. This is a very plainly-ornamented guitar with a white script "Gibson" logo, single bound spruce top, and 3-ply soundhole ring; still, the black and white cosmetics give it a striking look. The L-00 model went through numerous design changes in a short period of time in the early 1930's; this is one of our favorite versions, an exremely light and responsive guitar, great-looking and a fabulous fingerpicker. Overall length is 38 1/2 in. (97.8 cm. ), 14 3/4 in. (37.5 cm.) wide at lower bout, and 4 7/16 in. (11.3 cm.) in depth at side, taken at the end block. Scale length is 24 3/4 in. (629 mm.). Width of nut is 1 3/4 in. (44 mm.). Appears all original, including "Depression special' unplated brass strip tuners with the one-piece base. Several repaired top cracks, bridge reglued; general wear overall, mostly pickwear to the top and capo wear to the back of the neck. A very good player with a distinctive tone. Very Good + Condition.